Create the perfect outdoor living room with this complete 8-piece deep seating group, offering unparalleled quality, comfort and value in outdoor living. Sink in and relax with true deep seating featuring 5-inch thick Sunbrella® fabrics wrapped over high density cushions with accent toss pillows. 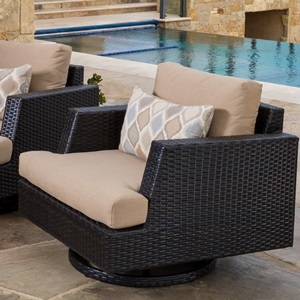 Constructed from the highest quality materials engineered for outdoor use, this outdoor seating set is perfect for any outdoor relaxation space. Natural stone veneer is durable and allows plenty of room for refreshments, drinks and more. Curated designer look offers Sunbrella® fabric to ensure comfort, design, and convenience. Designed too coordinate with the pieces in the Portofino Comfort Collection in Heather Beige.